Focusing on a serene sense of space and proudly overlooking the Burj Al Arab Jumeirah, this is a truly sensational hotel. 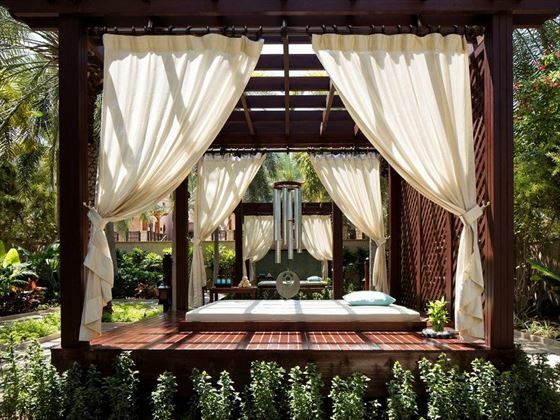 Part of Madinat Jumeirah Resort and nestled along Dubai’s longest stretch of private beach, there’s just no denying that this retreat oozes charm and glamour, making it one of our most luxurious Middle Eastern properties. The architecture and décor here is a breath of fresh air. Walk along the inland waterways, taking in the peaceful ambience and listening to the gentle waves, and cosy up in your sleek suite overlooking swaying palms and sparkling water. This stunning oasis is clearly inspired by the soaring sand dunes and bright blue sky that serves as its backdrop. 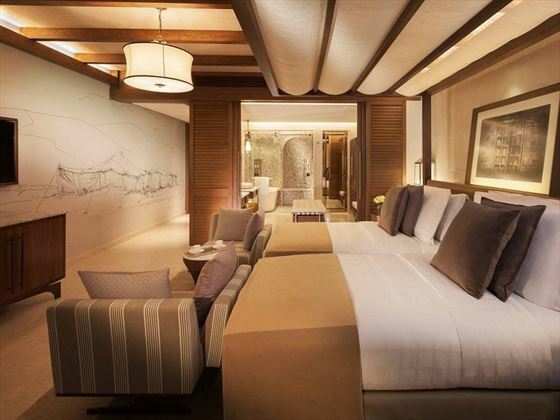 The lavish rooms and suites are reminiscent of Dubai’s Bedouin traditions, with luxuriant décor and opulent amenities. We’ll always suggest upgrading to a spacious suite, not only for the indulgent décor and amenities, but also for the complimentary access to the Summersalt Beach Club. An intimate space where you can relax and dine on flavoursome cuisine, this exclusive club will make you feel like a VIP. There’s plenty to keep you entertained should you fancy a break from the beach. With a whopping five swimming pools to choose from, you won’t be short of sun loungers or places to take a refreshing dip. The Talise Spa is perfect for those hoping to fully unwind, whilst families will love the complimentary access to Wild Wadi Waterpark™ and Sinbad’s Kids Club. Once you’ve worked up an appetite, there are over 50 restaurants and bars to choose from. From flavoursome Moroccan cuisine with spectacular views, to healthy family style meals, there’ll be something to tantalise everyone’s taste buds. 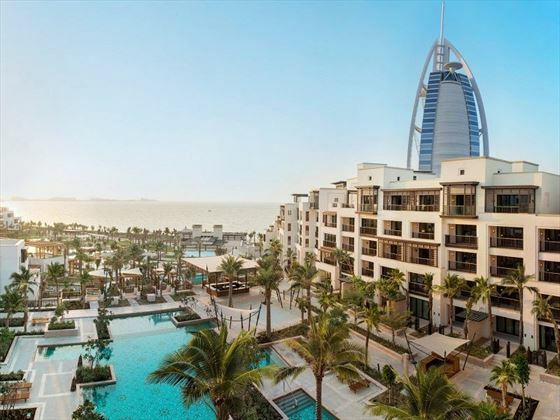 If that wasn’t enough, guests will also have access to the other three hotels’ facilities in the resort, Jumeirah Dar Al Masyaf, Jumeirah Mina A’Salam, and Jumeirah Al Qasr. 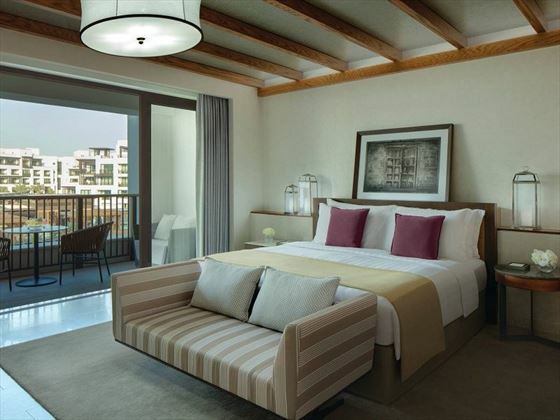 As part of the Madinat Jumeirah resort, this luxurious hotel is perched near to Burj Al Arab Jumeirah. Nestled on an endless stretch of private, pristine beach and surrounded by lush tropical gardens, the ambience here is secluded and tranquil. Resort Deluxe – Calming 51sqm rooms with open plan bathrooms and great views of the resort, the gardens, or the swimming pools. Sleeps two adults and two children. 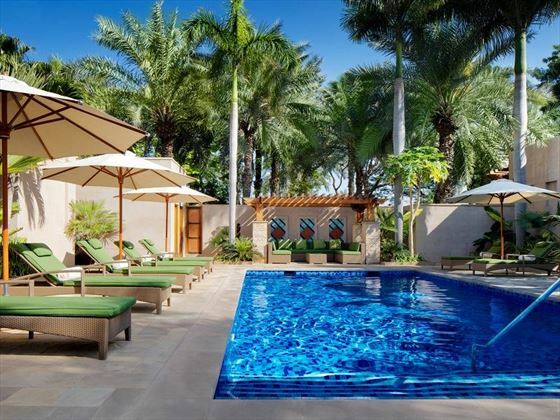 Resort Superior – Relaxed 60sqm rooms with contemporary décor, an enclosed balcony-come-outdoor living area, open-plan bathroom, and views of the gorgeous resort gardens and pools. Sleeps two adults and two children. Ocean Deluxe – Modern 51sqm rooms with open plan bathrooms, and stunning ocean views. Sleeps two adults and two children. Ocean Club Superior – Contemporary 60sqm rooms with an expansive terrace-come-outdoor living area, plus unforgettable ocean views. Sleeps two adults and two children. Family Suite – Spacious 126 suites ideal for families. Featuring a master en-suite bedroom, extended outdoor living areas, a separate living room with a sofa bed, and lovely views of the resort and the ocean. Guests also have Lounge benefits. Sleeps two adults and two children. 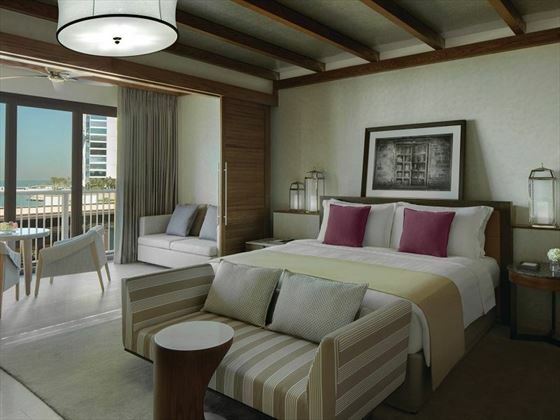 One Bedroom Ocean Suite – Soothing 135sqm suites with gorgeous sea views. 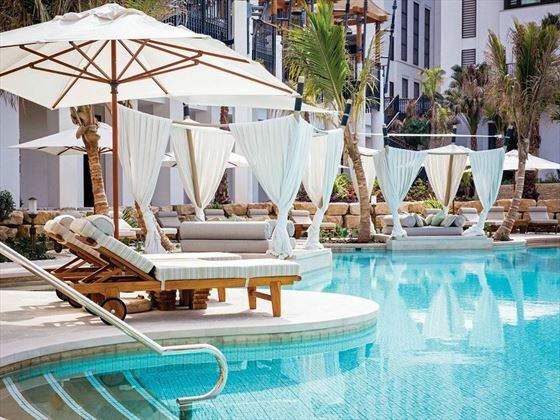 Featuring open plan bathrooms, outdoor living areas, Lounge benefits, and access to the Summersalt Beach Club*. Sleeps two adults and two children. Presidential Suite – These 300sqm suites are closest to the beach, with unsurpassable views of Burj Al Arab Jumeirah and the private beach. Featuring two bedrooms and bathrooms, indoor and outdoor spaces, plus Lounge benefits and access to Summersalt Beach Club*. Sleeps four adults and two children. 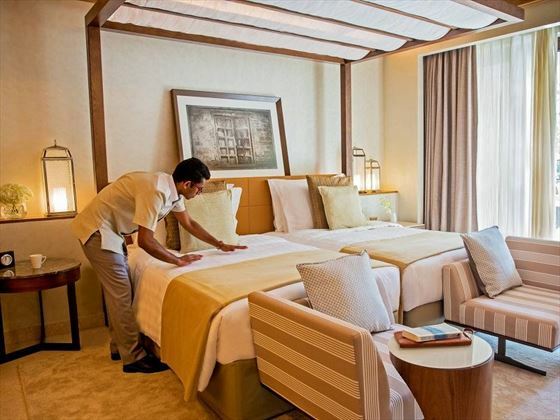 Royal Suite – Located in the centre of the resort, these 500sqm suites offer beautiful views across to Burj Al Arab Jumeriah and the skyline of Palm Jumeirah. Featuring two large bedrooms, a living room, a cinema room, a living outdoor space with a landscape garden, and a fitness room. Guests also have Lounge benefits and access to Summersalt Beach Club*. Sleeps four adults and two children. *Summersalt Beach Club – Overlooking the Arabian Gulf, this luxurious club offers a wonderful spot to soak up the sun, whilst dining on cuisine inspired by the Arabian spice route. Madinat Jumeirah is home to over 40 restaurants, bars and loungers, and guests of Jumeirah Al Naseem have access to all. Here’s a little insight into what you could devour during your stay. 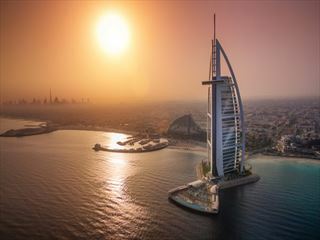 Al Mandhar Lounge – With a name translated as ‘amazing views’, it’ll come as no surprise that you’ll be dining amongst spectacular vistas of Burj Al Arab Jumeirah and the Arabian Gulf. The elegant lounge serves Moroccan inspired cuisine with Parisian influences, washed down with local Emiratis’ favourite drinks. Ambar – A contemporary rooftop bar offering sensational sunset views and a fantastic nightlife spot. The name and the ambience is inspired by a scent used as the base of traditional Arabian perfumes – warm, musky and oriental. The Palmery – Inspired by the place within a botanical garden where palms are grown, this vibrant restaurant offers fresh produce and healthy cuisine, served as a buffet or as family style dishes. 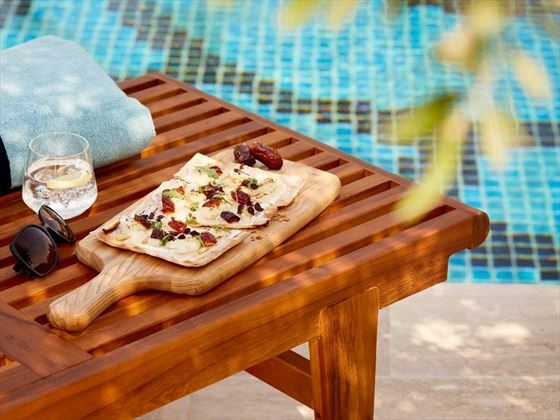 Kalsa Pool Bar – A friendly and sociable bar serving up delicious healthy pool snacks including flatbreads, trendy super foods, and Sicilian pizzas. Rockfish – A casual restaurant specialising in incredibly fresh seafood, all inspired by Mediterranean classics with subtle Arabian flavours. 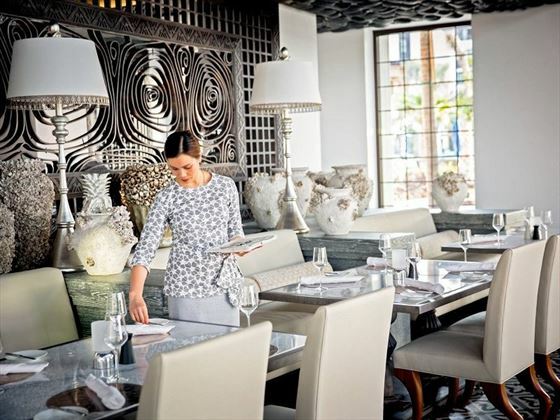 Summersalt Beach Club – A relaxing, beachside club offering cuisine inspired by the Arabic spice route. 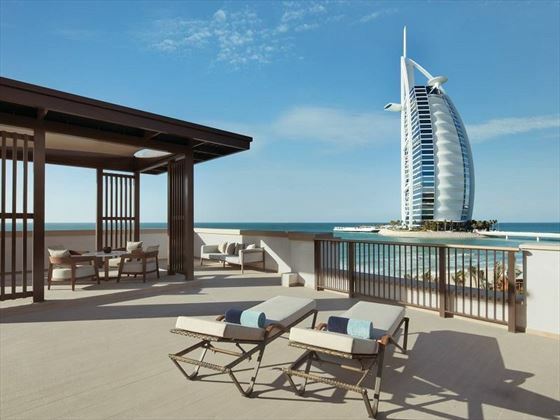 Reserved for Burj Al Arab and Jumeirah Al Naseem suite guests, though others can purchase a day pass. Sugarmash – A lively Polynesian pool bar located next to the adult-only pool, offering a mix of Caribbean inspired drinks fusing the tangy flavours of pineapple, ceviche, banana leaf, coconut and lime. Talise Spa – With a variety of tailor-made treatments and wonderful facilities, including an infra-red sauna, this relaxing spa is very indulgent indeed. Those on a romantic break will relish a decadent massage in one of the couple suites. 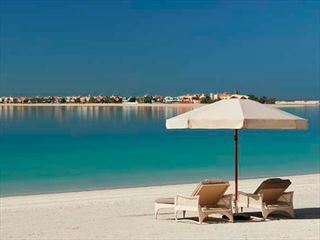 Madinat Jumeirah resort has two kilometres of beach, which is accessible only by guests of the resort. 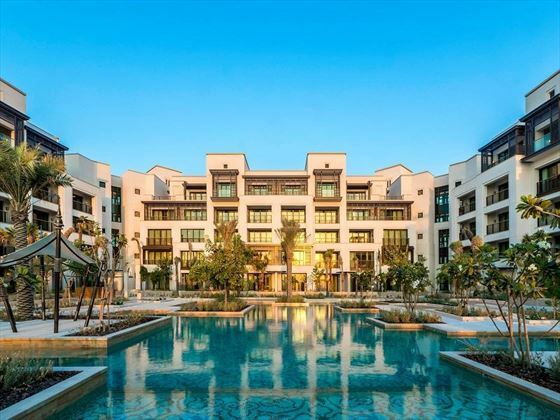 You’ll also have access to the pools around the Jumeirah Dar Al Masyaf summer houses, in Jumeirah Al Qasr, and on the Jumeirah Mina A’Salam rooftop. Complimentary guest passes to Wild Wadi Waterpark - family days out don’t get much better than a complimentary trip to Wild Wadi Waterpark.